Running on Pixie Dust: Magic Kingdom Fireworks - Without a Park Ticket! Magic Kingdom Fireworks - Without a Park Ticket! One of my favorite attractions on any Walt Disney World trip is taking in the fireworks at Magic Kingdom. Whether it's Wishes or one of the seasonal shows, there is nothing quite like watching this nighttime spectacular over Cinderella Castle. The music and fireworks quite literally brings tears to my eyes each visit. 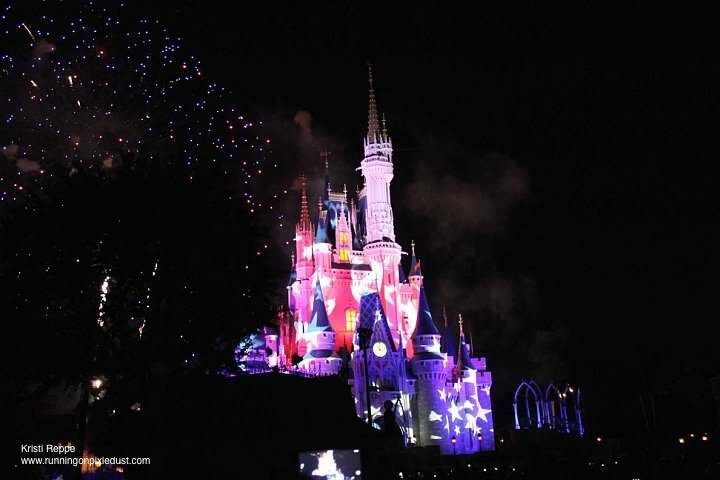 Of course, the best place to watch the fireworks is right in front of the castle inside the park, but many don't realize that there are other great options to experience fireworks that don't require you to have a park ticket. Restaurants - Who doesn't love dinner and a show? California Grill (Disney's Contemporary Resort), 'Ohana (Disney's Polynesian Resort), and Narcoossees's (Disney's Grand Floridian Resort and Spa) all have views of the Magic Kingdom fireworks and dim the lights while piping in music to provide guests with a great experience. Reservations around fireworks times are difficult to get so make sure that you are ready to book 180 days in advance. Time your reservation about 90 minutes before fireworks are planned to start and you should be ready to enjoy your dessert while the fireworks display takes place. Beaches - The beaches at Disney's Polynesian Resort and Disney's Grand Floridian Resort and Spa both have beautiful views of the fireworks. Recently, a new FREE (yes, you read that right, FREE) viewing party has been opened at the Grand Floridian. The party features decorations and food and beverages for sale while you watch. The best part - this isn't open to just guests of this resort! Boats - There are two cruises on the Seven Seas Lagoon that also offer fireworks viewing. The Ferrytale Wishes Dessert Party features sweets and beverages included in the price tag while you watch the fireworks and enjoy the music just like you were in the park. For a more daring adventure on the high seas, there is also a Pirates and Pals Fireworks Cruise where you enjoy snacks and drinks at the Contemporary with Captain Hook and Mr. Smee before setting sail with some pirate friends around the lagoon to see the fireworks. When you return back to land, Peter Pan is there to greet your party. Each of these options do have a price tag attached, but feature more than just the viewing when you factor in the food and experience. These non-park options are great if you don't have a park hopper option on your tickets and want to take in the fireworks on a night you were not in Magic Kingdom. Or, those of you who are lucky enough to be locals might like to check out the fireworks without braving the Magic Kingdom evening crowds. I'm excited to use some of these options on my upcoming trip for Princess Half Marathon weekend when my friend and I have opted to save some money and skip park tickets. Whatever your reason, all of these viewing locations provide a wonderful alternative to watching the fireworks from inside the park.